● Browser: Microsoft Internet Explorer 9 or above* If you couldn’t launch CMS on your PC, please read this. Product specification AVTECH CMS Professional for all-scale projects managing from 16 to 65535 devices. Global monitoring and control become so easy and efficient with its e-Map configuration, instant event pop-up display, health check and failover mechanism. AVTECH CMS Standard offers a friendly GUI for easy control and management of a 16CH ~ 64CH system. Client-server Mode Client-server mode available to manage larger system with multiple computers. Device Search Supports device search of all NVR devices within a local network, and also allows connection to a remote NVR via Internet for off-site management. Port Forwarding Forwards ports automatically, and finds all the IP cameras under a specific NVR device within a local network. 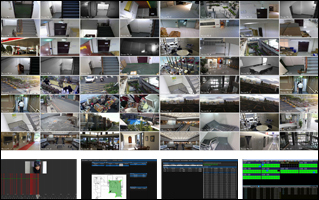 IP cameras can then be easily managed by this software. 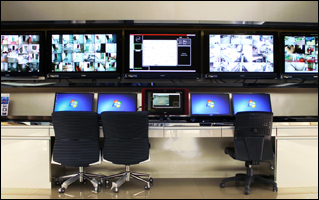 Multiple monitor display Supports up to 8-monitor display and able to define purposes of each monitor Supports up to 4-monitor display and able to define purposes of each monitor. Total Live Display CH Number Supports each monitor up to 96CH live display. Supports each monitor up to 64CH live display. Area Live Display Clicks on a defined group/area on E-map to watch live footage of that area (up to 16 cameras / per area). Predefined Display Supports 96ch Predefined fixed patent live streaming display. Supports 64ch Predefined fixed patent live streaming display. Multi-layered Setup Supports multi-layered maps with camera location on it for intuitive management..
Group Display Cameras can be grouped by area, allowing users to monitor live footage group by group. Event Notification When an event occurs, the alert indicator shows on the layer of the maps and the camera location on the map. Event Pop-up When an event occurs, the event monitor pops up the channel immediately with live display. Up to 4CH event pop-ups are supported. When an event occurs, the event monitor pops up the channel immediately with live display. 1CH event pop-up at a time is supported. To see event playback with pre-alarm recording, click on the pop-up again. To see event playback with pre-alarm recording, click on the pop-up again. Camera Management No. Manages up to 65535 cameras. Manages up to 64 cameras. Audio Alert Supports audio alerts to attract users’ attention to new events. Alarm Input Allows multiple alarm inputs to trigger PTZ camera move to preset points. Detection Schedule Scheduled event detection allows event detection to work only within specific period of time device by device. Event Search Searches video files by date and time or by event. Detail Check & Snapshot Supports full-screen playback in high resolution and digital PTZ to examine part of a megapixel image, while snapshot is also available anytime during playback. Footage Conversion Exports audio and video evidence in the “AVI” format, which is compatible with popular video players. Computer Status Shows the status of your PC, such as CPU usage, RAM usage, network upload/download speed, in the control panel for loading check. Regular Report Detects and reports the system status periodically, such as NVR online/off-line, camera video loss, UPS status, HDD issue (No HDD, Clean HDD, HDD overheat), etc. User Account & Privilege Supports unlimited user accounts, selectable user levels and configurable user access rights: Administrator / Power User / User / Guest. File Export Exports video files from CMS.